July 21, 2017 – Lockheed Martin Space Systems is prototyping a deep space habitat for NASA by refurbishing a shuttle-era container used to transfer cargo to the International Space Station (ISS). The prototype will integrate technologies to keep astronauts safe while onboard, but allow the habitat to operate autonomously when it’s unoccupied. NASA recently awarded Lockheed Martin a Phase II contract for the Next Space Technologies for Exploration Partnerships (NextSTEP) habitat study. As part of Phase II, the team will continue to refine the design concept developed in Phase I and work with NASA to identify key system requirements for the Deep Space Gateway. Included in this work, the team will build a full-scale habitat prototype in the Space Station Processing Facility at NASA’s Kennedy Space Center and a next-generation deep space avionics integration lab near Johnson Space Center. The main program office and full program team is at Lockheed Martin’s Littleton, Colorado facility. A full-scale prototype of the deep space habitat will be built by refurbishing the Donatello Multi-Purpose Logistics Module (MPLM). Donatello was one of three large modules, flown in the space shuttle payload bay, that were used to transfer cargo to the ISS. The work will occur over 18 months and will build on the concept study performed in Phase I. Phase II will focus on rapid prototyping and working on concept refinement and risk reduction. In Littleton, Lockheed has a full-scale mock-up and a lab where the team is using virtual and augmented reality to reduce cost and schedule, as well as to identify and solve issues early in the design phase. The results, which will provided to NASA, will further the understanding of the systems, standards and common interfaces needed to make living in deep space possible. NextSTEP is a public-private partnership model that seeks commercial development of deep space exploration capabilities to support more extensive human spaceflight missions in the proving ground of space around the moon, known as cislunar space, and to enable transit to Mars and other deep space destinations. NASA’s Orion spacecraft, also built by Lockheed Martin, is the first component of human exploration beyond low-Earth orbit and will be capable of sustaining a crew of four for 21 days in deep space and returning them safely to Earth. The Deep Space Gateway is intended to augment the Orion capsule with the development of capabilities to initially sustain a crew of four for up to 60 days in cislunar space, with the ability to scale up to transit habitation capabilities for future missions. Employing the Orion spacecraft as the Deep Space Gateway command deck early on allows for a safe and practical approach for the incremental build-up of deep space capabilities. Moving outside of low Earth orbit where the ISS resides, the habitat would be placed in a lunar orbit to be specified by NASA. Its crew would be more autonomous and less dependent on ground control – a more realistic scenario for Mars and other deep space destinations. This would allow crews to identify and pioneer innovative solutions to technical and human challenges that could only have been discovered or engineered in deep space, but with the ability to return to Earth in a few days, if necessary. When the habitat is occupied, astronauts will be able to rely on many of Orion’s advanced capabilities including power-coupling, communications, radiation protection and life support systems – this will reduce the complexity of the habitat and increase affordability. It also provides more room for bigger, bulkier items that wouldn’t fit in Orion – such as the crew’s food, water, air, hygiene needs, personal effects storage and exercise equipment. The less modification needed for the habitat, the more efficiently it can function when the crew is not present. Because the habitat will not be continuously occupied, its systems will need to survive without regular maintenance. In this way, it will utilize capabilities common to other Lockheed-built spacecraft like Juno and MAVEN. 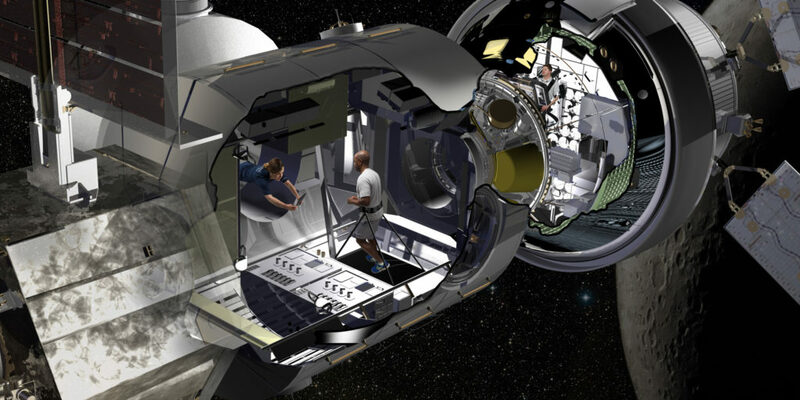 In addition to the U.S. industry, NASA is in discussions on collaborative opportunities with international partners to enable fully operational deep space habitation capability. NASA is targeting functional habitats in the 2020s. NextSTEP is managed by the Advanced Exploration Systems Division (AES) in NASA’s Human Exploration and Operations Mission Directorate. NextSTEP is an example of NASA’s increased commitment to partnering with industry to stimulate the growth of commercial industry in space while enabling NASA’s human exploration mission.